Colloredwolfs requested that I draw this piece and provided me with a very brief explanation of what he wanted to see. 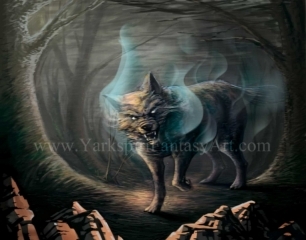 In the request he mentioned only that he wanted to see a demon wolf and therefore I created this painting. While painting this piece I focused on only using a single brush to properly render this piece. To view my drawing process, please feel free to view my tutorial below on “Demon Wolf ! (How to Paint digitally) – Art Illustration” in my unique style. The video Tutorial is also available in the “Video Tutorial Sidebar Menu” or by following the link to the main YouTube channel.